Minutes of Love in the Hours of Life speaks from the heart about love and life, the joy of life seen from different cornres of the world. A love that inspires and takes you to a parallel place through time and space, I call it the stand-still phase, where positive emotions and feelings flow freely within and into those you love. "...the warmness of your essence, fluxing in a radiant rythm, ...your angelical gaze, which sings of that sweet fire within you..."
Born and raised in Peru. By 13 years of age have traveled througout South America and started to write. In 1991 moved to Virginia, USA. 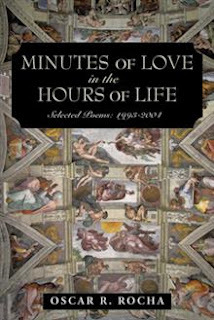 By 20 years of age traveled throughout Western Europe and focused my writings to essays about human values and poetry about love and life. In 2001 joined the US ARMY, served with the 82nd Airborne Division in active combat. Currently living in Northern Virginia, recently received a B.S. in Biology, interested in public health, the human spirit, acts of random kindness, global cultural diversity and realities. Oscar is giving away a $25 Gift Card! Writing an essay is an exercise in the usage of ideas. While writing your essay, first you have to select a suitable topic and verify it for feasibility by doing some research in the library and by consulting with your lecturer for essay example (http://www.buyessays.us/) structure.